A download Ski-Doo or SkiDoo snowmobile repair manual, also termed Ski-Doo service manual, Ski-Doo workshop manual or SkiDoo shop manual, is a downloadable book of repair instructions for learning how to perform maintenance, service or repairs to the snow-machine. A snowmobile repair manual is an invaluable aid in maintaining your snowmobile, as well as fixing any problems that arise with your machine. Repair manuals, also known as shop manuals, may be available from the snowmobile manufacturer or from a third-party publisher. Each snowmobile repair manual is specific to the manufacturer and will usually cover models for a range of years. A snowmobile repair manual may cover more than one model for a specific manufacturer. You may purchase a hard copy of the manual, but downloadable electronic manuals are also available, especially for newer models of snowmobile. The snowmobile repair manual should be arranged in a rational order, starting with a well-organized and detailed table of contents. The first part of the manual will be general information on the snowmobile. 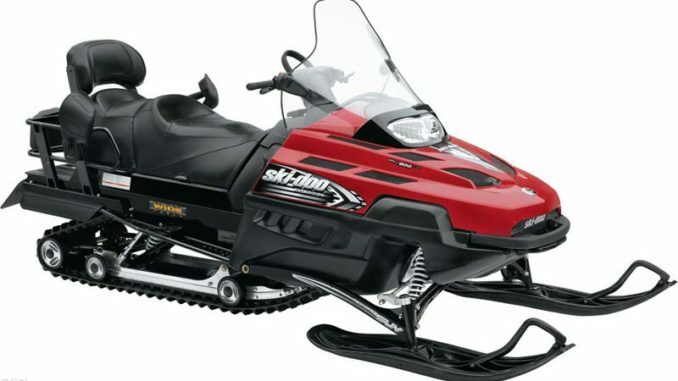 Detailed information and specifications for each part of the snowmobile will be included in this section. The general information section will include how to find the VIN number and Engine Serial Number (ESN). This section will also give specifications for the gas and oil to be used, as well as the ratio of gas to oil if your model of snowmobile requires a mix. The general information section will also contain sub-sections for each warning light or icon and its meaning, as well as a chart of diagnostic codes, to aid in identification of problems. The rest of the general information section will explain all parts of the snowmobile, such as the exhaust system, cooling system, battery, the drive and driven clutches, fuel pump, shock absorbers, brake system, and the tracks. The sub-section on each part of the snow mobile will have clear illustrations. The general information section should also include a complete list of tools and equipment needed to work on the snowmobile, as well as safety information. The following is a list of main chapters found in a Ski-Doo repair manual. The manual covers every aspect of repair, from basic maintenance to complete engine overhaul. All snowmobile repair manuals will have a section on regular maintenance, starting with a periodic maintenance checklist. The checklist will include such tasks as checking the oil level, changing the oil and oil filter, checking the coolant, changing the spark plugs, checking and replacing the battery when needed, replacing the clutch, checking the brakes, replacing the fuel filter, greasing the rear suspension, and changing the air filter. Doing regular maintenance as suggested in the repair manual will greatly prolong the life of your snowmobile. The snowmobile repair manual will have step-by-step, illustrated instructions on how to do necessary repairs. Some of the repairs that will be covered in the manual are: replacing the drive and driven clutches, replacing the brake pads, rebuilding the carburetor, replacing a water pump belt, aligning the tracks, replacing the chaincase seal and bearing, installing the transmission, and rebuilding the engine. The snowmobile repair manual will also include information on repairing parts of the hood and bumper. The repair manual will also explain how to remove and replace the coolant and gas tanks. A good snowmobile repair manual will also caution you on which repairs are best left to a professional mechanic. However, with the proper tools and a well-written snowmobile repair manual, you should be able to maintain and repair your snowmobile yourself and save hundreds of dollars in repair bills. The money spent on a snowmobile repair manual is money well spent. I need a download repair manual for 2009 model, you have one?